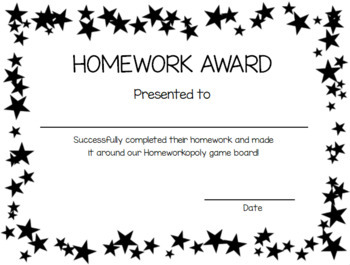 This is a great way to reward those kiddos that complete their homework on time. I have a Homeworkopoly board in my room. Once they make it completely around the board and back to GO, I give them this certificate! However, with it being editable, you can change the wording to fit the needs in your classroom. Completely editable! I created this in Publisher. Please make sure you have the correct program to open this file before you purchase. The font I used is KG Miss Kindergarten.